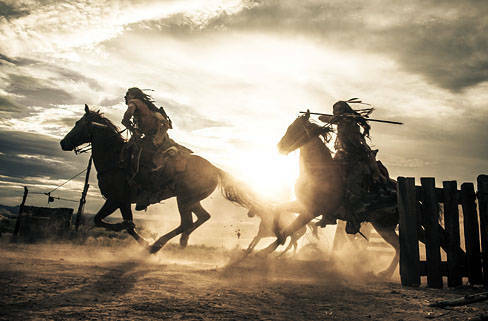 Decades after the Lone Ranger last hit the silver screen, the classic Western hero rises from the dead yet again this summer, thanks to a posse of proven box-office kings. Trading tricorns for ten-gallons, the crew behind Disney’s and Jerry Bruckheimer Films’ billion-dollar Pirates of the Caribbean franchise began production of The Lone Ranger in Albuquerque in February 2012, and the film opens nationwide on July 3. The story so far: Scorned by his fellow Comanches because of a childhood mistake, Tonto is doomed to the life of an outcast. He blames Butch Cavendish for his sad fate and searches the West for the outlaw, a man who has the gruesome habit of maiming his victims. Tonto’s quest for restitution and justice takes him nowhere until he happens on a battered young lawyer who’s been left for dead by the very same Butch Cavendish. Recently returned from law school, John Reid had hoped to bring his brand of order to Texas, but Cavendish and his henchmen gunned down Reid, his brother Dan, and their small detachment of Texas Rangers. Tonto resurrects Reid, recognizing the spirit warrior within him. He tells Reid to hide his true identity from the men who ambushed the Rangers and doomed Tonto to the life of a pariah. A bullet-ridden piece of the late Dan Reid’s vest becomes John’s mask. The sidekicks go in search of Cavendish together. Their journey begins at an elaborate saloon operated by Red (Helena Bonham Carter), and takes them across the American West to pit them against a new evil—one bigger and more dangerous than they could have imagined. The legend of the Lone Ranger has been updated for the new millennium by director Gore Verbinski, producer Jerry Bruckheimer, and Johnny Depp. Tonto, the hero and narrator, is a trickster like Jack Sparrow, from Pirates of the Caribbean, a wily, eccentric savant. Tonto has a plan; you’ll just have to watch it develop. These are the ingredients for an April day on the set of The Lone Ranger: Two full-size, operational, replica trains, complete with tracks. One bandstand, with band. Two hundred extras dressed in 19th-century garments. And that’s just what’s in front of the camera—a re-creation of the driving of the Golden Spike at Promontory Summit, in 1869. Step back, and the scale only grows as you encounter hundreds of crew members responsible for dressing the extras, designing and decorating the set, running the trains, feeding at least 400 people, managing the cast and crew, and, of course, shooting the movie. Film is often thought of in terms of two inflexible and uninformative numbers—budget and box-office revenue. Neither of those metrics accurately furnishes the number of crew involved in a production, the size of the sets built, or the number of locations used. The Lone Ranger keeps elite company when measured by its expenditures (perhaps only 2012’s The Avengers spent as much in New Mexico), but is in a class of its own when it comes to the size of the production. The film shot in five states over the course of 150 days, the bulk of them in New Mexico. (Most blockbusters shoot around 100 days, while smaller films usually schedule some 40 days.) They built no less than 10 elaborate sets, on soundstages and on location. And they hired hundreds of people to work behind the cameras, and put just as many in front. In New Mexico, the production concentrated many of its activities at a humble locale along central New Mexico’s Río Puerco. Construction crews worked around the clock, building the clapboard town of Colby. They put up a bank, a ranch, a granary, a saloon, and a train station. Promontory Summit went up just around the corner. Around the town, train crews laid five miles of track, all fully functional. The trains, built just for the film, were based on historical locomotives. The real Jupiter was built in Schenectady, New York, and was part of the Central Pacific Railroad before making its way to Promontory Summit for the driving of the Golden Spike. In the film, the Constitution meets the Jupiter, but a century and a half ago, a train called No. 119 met the actual Jupiter. The final locomotive was the Colby town train. For additional train action, special-effects technicians and woodworkers put together “road rigs”—steel platforms on which they placed full train cars so that filmmakers could shoot inside and outside the train as mountains rolled by in the background. Pulled by semi-tractors, these rigs drove through the mountains near Angel Fire for days. The Enchanted Circle also saw the end of production in New Mexico—Depp and Verbinski’s band played the closing party at Angel Fire. In his street clothes, Depp was nearly unrecognizable. As Tonto, Depp wore Comanche war paint and a crow headpiece designed by Joel Harlow, who also created Hammer’s Lone Ranger mask. She opted for clean black and white over the powder-blue suit worn by Clayton Moore in the 1950s television series. Many of these outfits came from a clothing factory installed at Albuquerque Studios, where costumers designed and sewed enough clothing for an army—literally. They also dressed miners, Comanches, townspeople, and circus entertainers, and stitched and pulled tight plenty of bustiers and corsets for the film’s painted ladies. Prostitutes and other forms of entertainment abounded at another intricate set built in New Mexico—an impromptu, end-of-the-tracks town called Hell on Wheels. Historically, camps like these, perhaps a little less extravagant than the one created for the film, did pop up as the trains and their work crews moved west. The filmmakers built their camp inside an Albuquerque Studios stage and at an outdoor location near the Galisteo Basin. Tents, shacks, Conestoga wagons, and an elevated train car—home of Red’s Amusements—all nestled into the hills. You could practically smell the whiskey in the air.